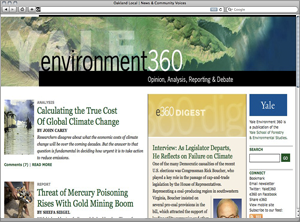 With initial three-year funding from the William and Flora Hewlett and the John D. and Catherine T. MacArthur foundations, and support from Yale University as publisher, the site launched in June 2008, with reported features by prominent journalists including New Yorker staff writer Elizabeth Kolbert (on environmental tasks facing the next U.S. president) and author Bill McKibben (on whether we’ve reached a carbon-dioxide tipping point). That summer, the site hosted an exchange on managing human population size: will too many people consuming too much ruin the planet, as Paul and Anne Ehrlich argued, or has ‘the population bomb’ been defused, as British journalist Fred Pearce claimed? “That drew tremendous reverberations,” Cohn says, with significant pickup by mainstream outlets. A central goal of e360 is to shape public debate on environmental matters, both in identifying issues and weighing in on those questions; but not as much in breaking news, certainly not in the daily news cycle. In 2009, e360 won the Online Journalism Award for best specialty journalism site in the small site category (100,000 to 1,000,000 monthly unique visitors). In part to reach a broader audience, Cohn struck a deal with the Guardian, which freely reprints e360 content with attribution and link-backs; he has a less formal content-sharing relationship with Reuters, as well. “Our first goal is to get the information out there,” he says. The MacArthur and Hewitt foundations re-upped funding for a second three-year cycle, and Cohn has found supplemental support from wealthy individuals with ties to Yale. The site does not sell advertising and has no plans to start doing so. Although the model may evolve in coming years, for now, e360 is a sustainable, philanthropically supported voice on environmental issues of the day–a luxury Cohn recognizes is exceptional.